Pralaya Yoga Studio is located in the heart of Houston, Texas in Montrose. 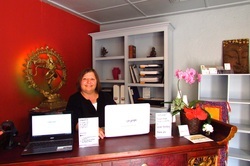 Upon entering our yoga studio you will be greeted by welcoming staff and students. We have plenty of space to stow your belongings, change into your yoga clothes and fill your water bottle with our free filtered water. Please arrive at least 5-10 minutes before the class or event you are attending. If you have questions send us a message or connect with us on any of our social channels.